Every time I eat arroz caldo, I can't help but think of that scene in the 1948 movie Oliver Twist, when all the orphans are eating their bit o' gruel and Oliver dares to ask for more. When I was younger, I would pretend my bowl of arroz caldo was the same gruel served at the orphanage. Sometimes my imagination could stretch far enough to pretend that the arroz caldo was cabbage soup, and I was Charlie Bucket. Whatever the story was that day, the premise remained the same: I am poor, cold, and hungry, and all I have to eat is this porridge stuff. 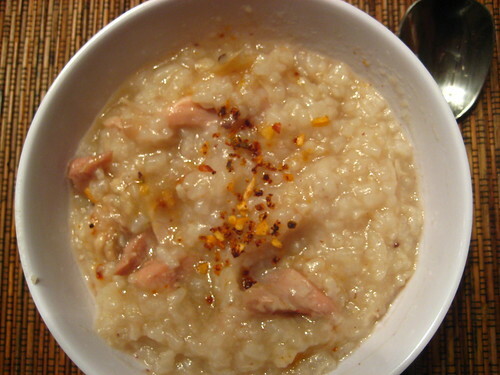 Arroz caldo is a Filipino version of rice congee. Porridge. And really, what's more comforting than porridge? A dish that can make even a young blonde trespasser feel at home in a house of bears. It wasn't until recently that I learned arroz caldo is traditionally served at Christmastime in the Philippines. So it was actually quite appropriate that my parents made this dish on the eve of Christmas Eve -- which I requested over the phone as I made my snowy, icy holiday drive through Chicago's northwest suburbs. Despite my pretending that I was eating gruel, arroz caldo is far from it. The dish is basically chicken simmered in garlic, ginger, rice, and water, topped with roasted garlic flakes. The flavor is rich and gingery, the chicken tender and moist, the rice soft and silky as it coats the bones and warms the belly on a cold, cold day. It couldn't be a simpler (or uglier) dish. Doesn't it sometimes seem as though the simplest, ugliest dishes are always the most comforting? 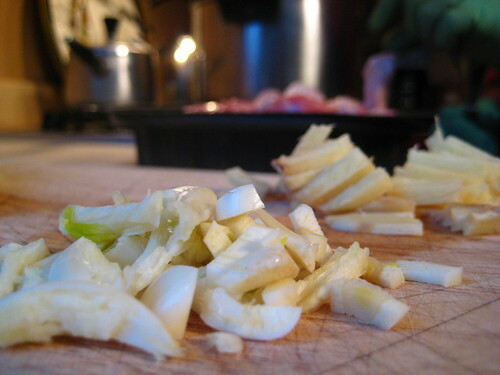 So true: the best foods sometimes aren't the prettiest. I love me some beef stroganoff, but I'll be darned if the pictures make it look totally disgusting. thanks, shannalee! and happy new year! 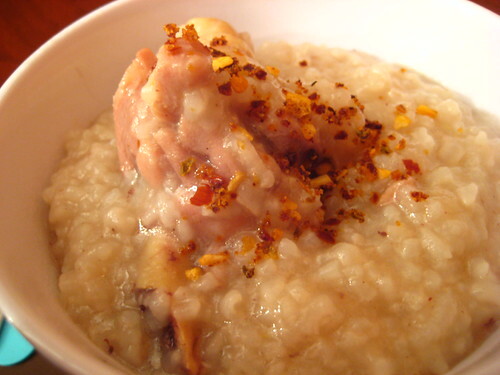 Arroz caldo is the blandest-looking dish but your photos make it look rich and oh-so-appetizing! tangled noodle - thanks! doesn't it look like gruel sometimes? DELICIOUS GRUEL. Haha, I love reading your blog. I'm filipino, but I don't really have a hand for cooking. But, I do love the food. I can't help but imagine too, when I eat Arroz Caldo. I think about the story of the three little bears. Blah I got the three bears and three little pigs confused, haha.